A HAB is an overgrowth of, cyanobacteria (blue-green algae) in surface water. Cyanobacteria are microscopic organisms found in all types of water. They are more like bacteria than plants, but because they live in water and use sunlight to create food (photosynthesis) they are often called "blue-green algae." Cyanobacteria are important to freshwater ecosystems because they make oxygen as a by-product of photosynthesis, and they are a food source for other organisms. 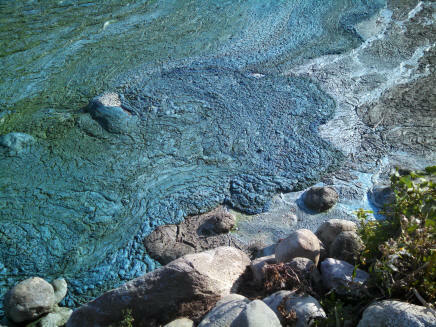 Under certain environmental conditions, cyanobacteria can multiply quickly and form a bloom. Some species of cyanobacteria produce cyanotoxins that are released when the cells die and rupture. The toxins can cause harm to people, wildlife, livestock, pets and aquatic life. Almost every year in North Dakota, a few cases of pet and livestock deaths occur due to drinking water with HABs. Once a waterbody has an excess of nutrients, the problem cannot be fixed overnight. Nutrients must be removed mechanically and/or allowed to be reduced naturally through internal cycling, while limiting the sources of nutrients in the watershed. Several North Dakota lakes have hypolimnetic drawdown systems that remove nutrient-rich water from the bottom of the lake. These systems can be effective at removing nutrients, but they do not address the nutrient sources. Sample the soil in your yard before you fertilize. Leave your grass clippings on the lawn - they give nitrogen back to the lawn. If you do need to fertilize, use only the recommended amount of product and keep it off sidewalks and other hard surfaces. Use field soil samples to calculate a nutrient budget for your crops. Complete a comprehensive nutrient management plan for your farm. Sample manure before applying it to the soil to ensure it is applied at the correct agronomic rate.